Gorleston-on-Sea Beach BeachGorleston-on-Sea Beach, near Great Yarmouth. Grassy cliffs with pitch & putt, bowling greens, tennis and basketball courts, trim trail, children's playground and gardens leading down via slopes or stairs to a long promenade. 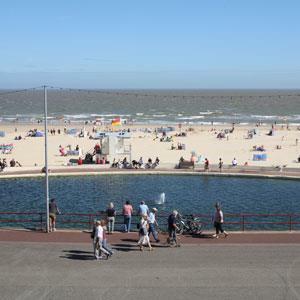 There are benches and undercover seating areas overlooking a stunning bay with a huge, wide curving, sandy beach with model yacht pond, children's splashpad and bouncy castles. With adjoining shops, cafes, amusements and amenity area, everything you need is close by. The town centre is just five minutes away & cliff top walks overlooking the Lower Esplanade and sea are easily accessible. RNLI Lifeguards patrol the beach between the red and yellow flags during summer months. Gorleston beach is a great spot for surfers of all levels to catch a wave and a popular location for body boarding too. 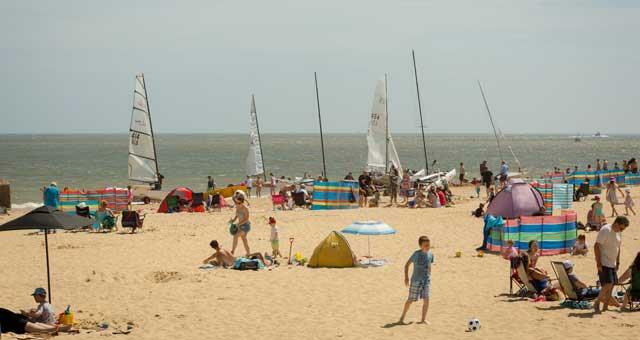 Gorleston beach can be very busy and the best winds for surfing here are said to be westerly with a northerly swell. Free parking is available, along with public and disabled toilets. From Great Yarmouth follow the A47 towards Lowestoft. Then follow signs for Gorleston. Clearly signed from the Town Centre. First Bus operates a number of bus services from Great Yarmouth, Market Gates to Gorleston.